Growing India's growing demands include a nice fast portal from the Indian Railways to book RAILWAY TICKETS. Indian Railways, besides being the largest employer in India, is also most popular medium of travel for ordinary Indians because of its connectivity and the cheap tickets. The ticketing business of Indian Railways is looked after by Indian Railway Catering and Tourism Corporation or IRCTC as it is popularly called. IRCTC has its own website for ticket booking which is popular among the Indians and is visited by 12 million unique visitors in a month. IRCTC is also the largest e-commerce website in India since its launch. 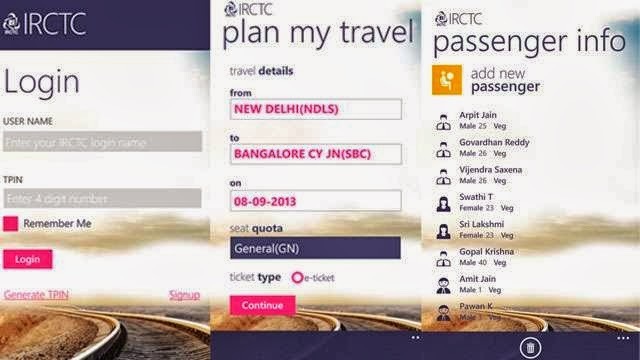 Now IRCTC wants to make the ticket booking a bit of easier for Windows Phone users especially the Nokia Lumia 520 and Lumia 620 users in India and it has launched a App for Windows Phone smart phones. Once you download the App, you will be allowed to book tickets using the app throughout the day, except for the time period between 8 am to 12 noon and 11:30 pm and 12 am. IRCTC has blocked the mobile users and agents from accessing the service to reduce the reduce the load on servers during these time. Coming back to the App and its features, apart from booking tickets with it, you can also check the PNR status online realtime anytime. The App also allows you to plan your journeys, check ticket availability, berths available, your previous or current ticket booking or cancellation history and time and schedule of the train. The App is also said to allow users to pin a ticket on their homescreen. Pinning the ticket to the homescreen will let you check the details of the PNR Status etc. without entering into or starting the App. The App is available for Windows Phone 7.5 and Windows Phone 8 so it can be used with Nokia Lumia 520, Lumia 620, Lumia 720 and the rest of the series. You can download the App from Windows Phone Store here. If you find the App interesting and useful kindly like and Google Plus this post so more and more people can know about it.